Gorillas Deluxe is a revamped version of the old MS-DOS game of Gorillas. 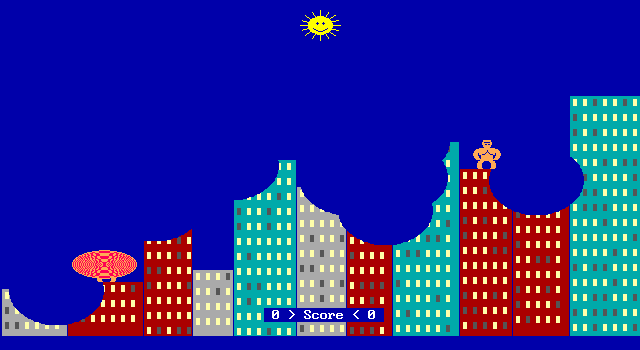 Some people will remember the old QBasic game Gorillas which shipped with MS-DOS 5, where two gorillas sit atop a cityscape trying to kill each other with explosive bananas. Well, I present here my revised version of the game – bigger and better than before. The game now features an improved user interface (all the rough edges are gone), up to 20 player records with a league table, improved graphics and sound, .ini file configuration and a few more improvements. In addition to the Deluxe Edition, I have also posted copies of the orignal Gorillas (ca. 1990) and a fixed copy of the original Gorillas intended to solve incompatibility problems with faster computers. Gorillas Deluxe is available in Czech thanks to the efforts of Jan Stejskal. Gorillas Deluxe is also available as a native Windows application. Gorillas, Gorillas: Fixed Edition and Gorillas: Deluxe Edition all need a copy of Microsoft QBasic to run. 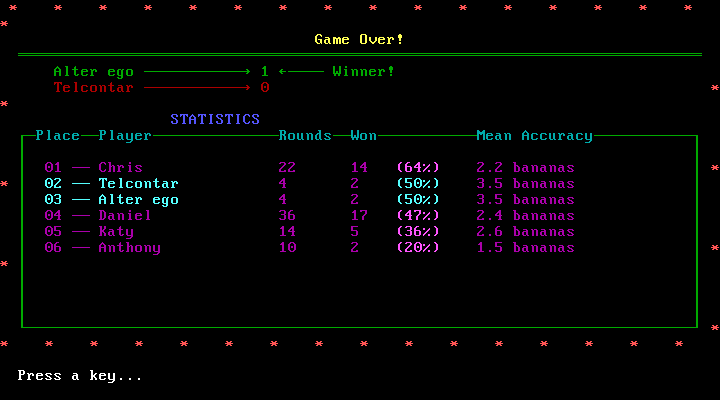 A copy of QBasic ships with Gorillas Deluxe, and is available as a separate download also. The final development on this game took place while Windows XP was still commonplace, and most people ran 32-bit computers. Modern Windows PCs are almost universally 64-bit and no longer run 16-bit MS-DOS applications. 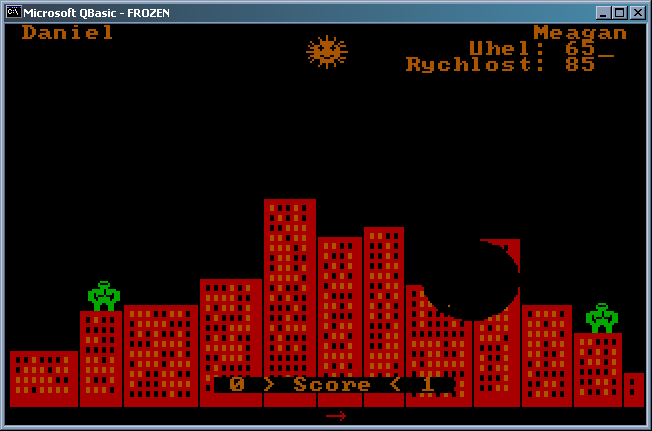 Gorillas Deluxe therefore requires the use of an MS-DOS emulator (e.g. DOSBox), with the exception of the compiled version, which has no sound. 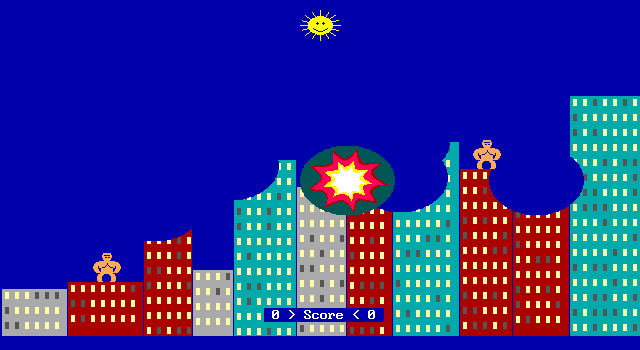 Gorillas Deluxe is a turn-based game where opponents, represented by gorillas, try to kill each other by throwing explosive bananas across the screen at each other. Banana direction and speed is controlled by entering in numeric values for angle and velocity for each turn; players will need to contend with gravity, wind, and buildings in the way. Once a banana makes its impact on a gorilla – bang – dead. Note that in CGA mode, the newExplosionRadius config parameter is halved due to the significantly lower screen resolution (320×200 as opposed to 640×350). A number of people reported that the original Gorillas no longer worked correctly on modern computers. This was predominantly seen as very sluggish performance, but “OVERFLOW” crashes could also be experienced. I patched up the original game to hopefully fix these two problems, as well as fixing the long-standing bug that bananas could collide with the bottom of the sun. I called this version Gorillas: The Fixed Edition. However, now that PCs no longer support NTVDM and cannot run DOS applications “natively”, this is only of interest to anyone maintaining an older 32-bit system. 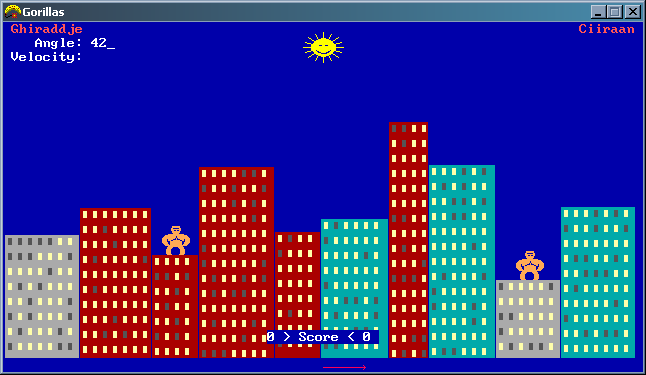 Andre Victor ported the original Gorillas Windows using his FreeBASIC compiler, and forwarded a copy of Gorillas Deluxe with key changes made. The source code remains virtually unaltered but the resulting program is Windows native and does not require QBasic at all (or any other libraries for that matter). I have cleaned it up a bit and released it as beta. The game functions virtually identically to the original, so you can simply place the executable into your existing Gorillas Deluxe folder and use your existing .ini file and league table. The game is not perfect, hence the beta status. There are problems with the port and problems with the compiler, and FreeBASIC does not and will not implement classic speaker sound, so the game is silent. 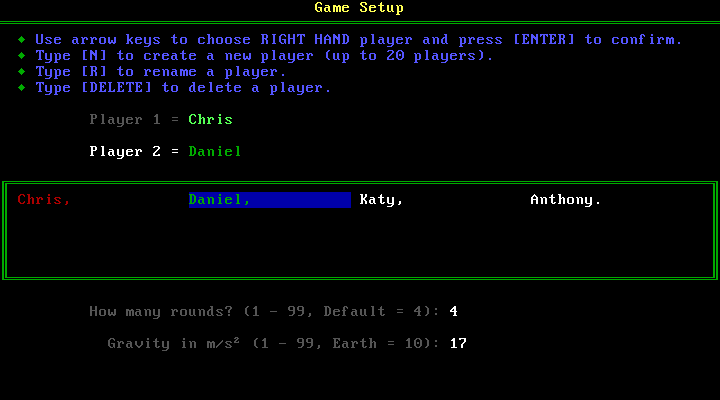 If for any reason QBasic will not run, this makes a passable alternative. The complete source code is included with the download.